This month, T.R. Crumbley challenged everyone with crepes. Crepes need to be pliable and study enough to be able to roll around a filling without cracking, yet have a soft, tender texture. Because I have fond memories of crepes from my high school French class (C’est magnifique! ), I went traditional with my crepes. 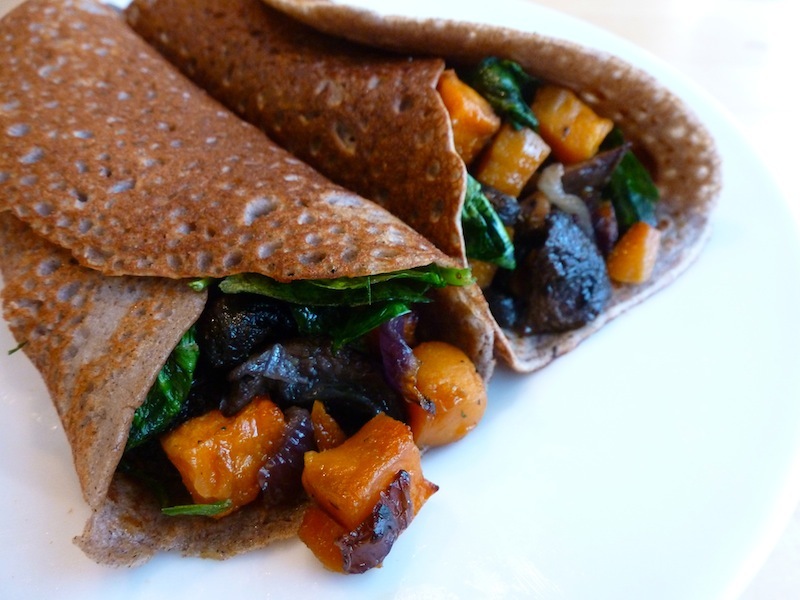 I wanted the lovely thin buckwheat galettes from my memories. I improvised a savory filling based on ingredients I had laying around in my kitchen to serve with salad as a light dinner. When I make crepes again, I would like to make a crepe that is not buckwheat based and more reminiscent of what my dad made for us on the weekends when I was growing up. They were a very thin pancake (very, very eggy) that we called German pancakes which were very similar to a crepe. We would wait very impatiently for them to come hot off the pan, sprinkle them with sugar and roll them up. Kid-time bliss! I also had a bit of trouble with the ratio working for me using just buckwheat flour (I know – of course! ), so ended up also using a GF flour blend I had mixed with 4 different starches in it to add stretch to the batter. The key, I think, with crepes is to let the batter rest. Get all the starches and flours really hydrated for best results. Actually, this makes crepes a perfect make ahead dish, as I mixed up the batter the night before and let it sit covered in the refrigerator. I had some batter left for the next day, and they were still wonderfully pliable. If you would like to cook the crepes ahead of time, you can wrap them well and they stay soft for 2-3 days in the fridge. A little tip, so you won’t be disappointed: don’t expect the first crepe (or sometimes even the second) to come out of the pan well. See that sad little dough blob next to the nice stack of crepes? Yeah… that is the sad first one. It is okay, though… it was still tasty sprinkled with cinnamon sugar! To make crepes: Put everything into a blender and mix. Put into a covered container in the refrigerator, leaving overnight. An hour before making the crepes, set the batter on the counter to get to room temperature. Heat a pan (I used an 8″ pan) over medium high heat. Oil the pan with just a touch of oil wiped around the pan (I use a bit of coconut oil or olive oil depending on my mood). Stir batter then pour a scant 1/4 cup batter into hot pan. Tip around pan to allow bater to flow around the edge of the crepe. Allow to cook until you see bubbles and the crepe is set. Use a thin edged spatula to slide carefully under the crepe and flip it over, cooking the other side. Continue with the rest of the batter until it is gone, stirring batter before pouring out each crepe to keep batter from settling. Heat oven to 400 degrees F. Mix all ingredients except kale on a rimmed baking sheet. Roast in preheated oven for 15 minutes. Add kale to pan and stir mixture around. Roast for 10 to 15 minutes more until sweet potatoes are tender and beginning to caramelize. Stir mixture carefully before serving. 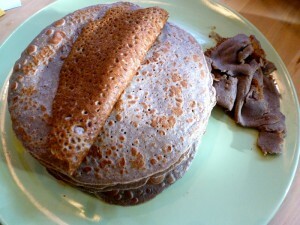 Use mixture to fill buckwheat crepes. Add pre-roasted chicken or black beans and salsa to the mixture if desired for a different twist. Enjoy! Feel free to add left over roasted chicken to the crepe with the sweet potato filling for a more substantial meal. Yum! They are some good-looking crepes! And that filling is lovely, so colourful and I love those flavours. Your crêpes look great and what a fantastic filling! It's just perfect for Springtime - great job!! Your crepes look just gorgeous. And your filling sounds so flavorful. This looks like a fantastic dinner--I have a big bag of kale in the frig ready and waiting, gorgeous photo too. 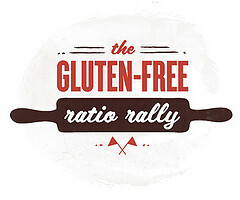 I totally agree with you on the ratio. I prefer them less eggy. Otherwise it's too similar to an omlette! :) Sounds fabulous. Thanks for joining the rally! It looks like your crepes came out delicious - and they look beautiful! I love the deep brown color on them. Your filling sounds amazing. I love kale, mushrooms and sweet potatoes and never would have thought to put all three of those together. Delicious! You had me at kale and sweet potato. :) This looks fantastic, and I too want to look into making crepes from around the world, particularly the Swedish pannkaka. Anyway, wonderful wonderful job. Welcome! These crepes look perfect! Buckwheat is perfect for the job. Your filling looks so rich and colorful, and loaded w/ lots of nutrition. Great looking crepes! We love buckhwheat... I'll have to try your version next time! Oh... and I love, love, love kale. Great filling! 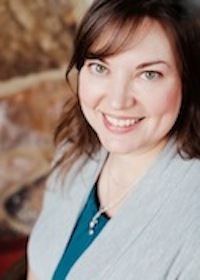 Awesome first Rally post, Angela! 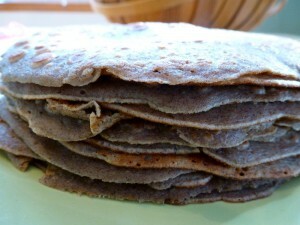 Even though I didn't use buckwheat in my own crepe recipe, it is one of my favorites for gluten-free cooking/baking/eating. Looking forward to future posts from you! These look sooo good, Angela! It probably doesn't help that I'm hungry as I'm reading this, but I am seriously craving your filling now. It's exactly the kind of breakfast I swoon over. Great job, and welcome to the Rally! I tried these, using an electronic scale. The only weight diff was the 3 eggs were 10g more. I started cooking them and they were really hard to flip, even when they sat for a long time. They didn't seem to cook inside, even though they were really thin. The only thing I did different was to only let it sit for one hour, while I prepared the filling. I decided to add a little more buckwheat and it made all the difference. Only, I'm not sure how much I added! They flipped much easier and cooked well. I think this particular recipe works better for a savory crepe. It has more of a savory taste (even without the filling). I have another GF crepe recipe that works really well, but this was nice to try something different. Thanks. The recipe is exactly the same as David Lebovitz's - yet no credit is given! He published his recipe in 2007. Thank you for your comment. I searched and see that you must mean this post: http://www.davidlebovitz.com/2007/07/planet-of-the-c-1/ While I agree they are similar in proportions (as are every other crepe recipe out there that works on similar ratios) they are not the same, nor did I "use" his recipe at that time. 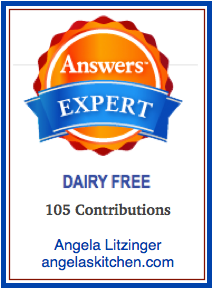 The wording, etc, ingredients used (the one above uses ALL gluten free and diary free ingredients, while Mr. Lebovitz's uses butter, whole milk and all-purpose flour) are different. However, there are going to be similarities to his and many other crepe recipes as they are all recipes for crepes. Crepes are traditionally made as a batter. They are made with a certain ratio of ingredients. They rest a few hours to overnight, cooked in a small skillet, Etc. During the process of working on this recipe for the Ratio Rally, we used Michael Ruhlman's book "Ratio" to work from which was my starting point, which I found too eggy for my liking. I used buckwheat as my base flavor, as it looks like Mr. Lebovitz did (along with many other people, according to a quick search on the internet) because it is a traditional flavor of crepes from France and it is a gluten free flour. I ground my own from buckwheat groats to be sure uncontaminated from gluten sources. However, straight buckwheat flour can be tricky to work with sometimes, hence the need I found for the starches. I also found my youngest would not eat a crepe made with straight buckwheat flour, so reduced it to the highest level she would eat at that time. Buckwheat can be a strong flavor. I added oil (olive) as I had sticking and hoped it would help as it does for pancakes and waffles, and to up the fat of the recipe to a closer one of milk as I could not use dairy milk (which I thought may have been part of the sticking and cracking issue I was having) and because it is in my dad's and grandma's German pancakes. Though I may try another fat next time, such as coconut oil (I would reduce the amount to about 2 T, if using coconut instead of olive oil). Thank you for bringing the similarities to my attention, as I take giving credit where it should go very seriously and have had quite a few recipes and photos stolen from this site. However, this recipe started as a base from Michael Rhulman, as I stated in the post. Frankly, the final proportions ended up more in keeping with my dad's/grandma's German pancakes than Michael Rhulman's. If you would like to further discuss the process of how this recipe came about, I would be happy to do so when you are ready to not hide behind an "anonymous" comment and use your real identity. Thank you.